Overcoats — De Oost Bespoke Tailoring - authentic tailoring and personal attention. 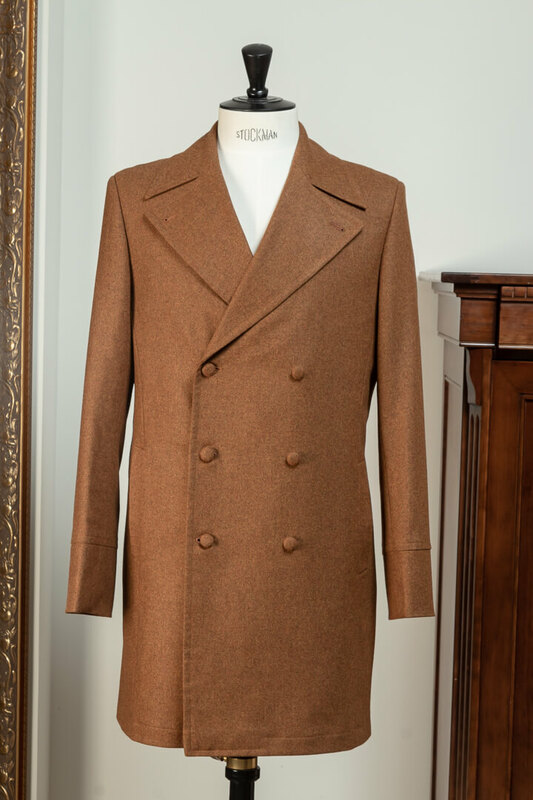 Collection of bespoke hand tailored wool, harris tweed, cashmere, camel and vicuna coats in a variation of styles. Ranging from classic models styles like the Trenchcoat, Raglan, Chesterfield and also personal designs. Coats & Cloaks from € 999,-. The weather. The favourite subject of Dutch small talk. Understandably so. Wind, rain, hail, snow. We have it all. So who better than the Dutch to create the perfect overcoat? At De Oost we consider our self quite the connoisseurs when it comes to coats. Warm, durable. Tweed, wool, cashmere, you name it. We believe a jacket or coat you buy now should not be out of fashion next year. We believe in being permanently fashionable instead of following the latest fads. Also when it comes down to overcoats. Being ‘permanently fashionable’ starts by being accountable to a personal set of physical trademarks and not to the random served-up fashion flashes. We sculpt our overcoats upon one’s less-than-perfect torso a set of raiment that inspires to a particular ideal. Dressing well pivots on 2 pillars – proportion and colour, the trick is to get the right personalised instruction. The galleries below show a selection of handcrafted, one-of-a-kind overcoats, custom tailored to the needs and desires of our clients.